I was inspired by the Tibetan prayer flags hanging on my deck that I’ve been enjoying all summer to make my own. I asked each member of my family for a word for their flag, and our words will give you some insight into us. My son Ben chose “Balance” which fits him so well and in many ways. He has great physical balance and loves to gravity ride (racing his bike down a mountain, the steeper the better). He constantly balances work and play, time on the computer and phones to kayaking and biking. My son Dan chose “Patience” and he certainly has a lot of it. He works with children in the local school where this is a great skill to have, and he has the patience to plant the seeds in our garden and bring them to maturity. He also likes to escape into our mountains to camp and get away from the demands of modern life. My husband, Michael chose “Cadence” which has meaning in rhythm, both music and activity. He loves to play guitar and is always learning new songs and practicing. He is big on road biking and keeps the season going as long as possible so he can enjoy his rides, some days up to fifty miles. I chose “Namaste” for my word because I love yoga and meditation, and have finally found my activity niche. I also love this word as a greeting or recognition of the other person, and feel the world is brighter when I do this. Step One: Sew canvas banners using zig zap stitch, or buy pre-made banners. Step Two: Paint a layer of DecoArt Media White Gesso onto each flag. Use a plastic card of a mini blade to smooth the gesso and a flat brush to work it into stitched areas. Dry completely. Step Three: Use the plastic card and flat brush to paint colors over gesso on each flag. I used the Americana Premium Acrylics in Yellow-Green Light, Quinacridone Magenta, Diarylide Yellow, and Cerulean Blue. Let dry. Step Four: Balance Flag - Take the blue flag and using the Cobalt Teal Hue and Tread Carefully and Short Circuit stencils, cover the flag with a random pattern. Let dry. Use a graphite pencil (so you can wipe away later) to sketch the bike rider, then go over with black ink and dry completely. Hand letter the word Balance with the copper pen, and once dry, outline it with the white pen. If you are unsure of your writing, lightly do it with the graphite pencil first. Step Five: Patience Flag - Use the green flag and stencil the fossil on several times. Use a mix of Green Gold and Quinacridone Gold so it will stand out. Use the Shedded stencil with the Phthalo Green-Yellow to fill in the open areas. Let dry. Hand letter the word Patience using a copper pen, and once that dries, outline the letters with a black India ink pen. Step Six: Cadence - Use the yellow flag, and stencil the music notes onto the flag in a random fashion with Vermillion Hue. Next, sponge on a few whirlpool designs using Quinacridone Gold. Let dry. Hand letter the word Cadence with black India ink. Step Seven: Namaste - Stencil the medallion in the center of the magenta flag, and at each corner with Dioxazine Purple. Let dry. Lay stencil over images again and stencil with a mix of Pale Gold and Dioxazine Purple. Mix Cobalt Teal Hue with Dioxazine Purple and use the stencil the hand designs. Let dry. Hand letter the word Namaste with a white acrylic pen. Let dry. Step Eight: Push the cord through the top opening in each flag. Use a skewer to help push the cord through if it gets stuck. 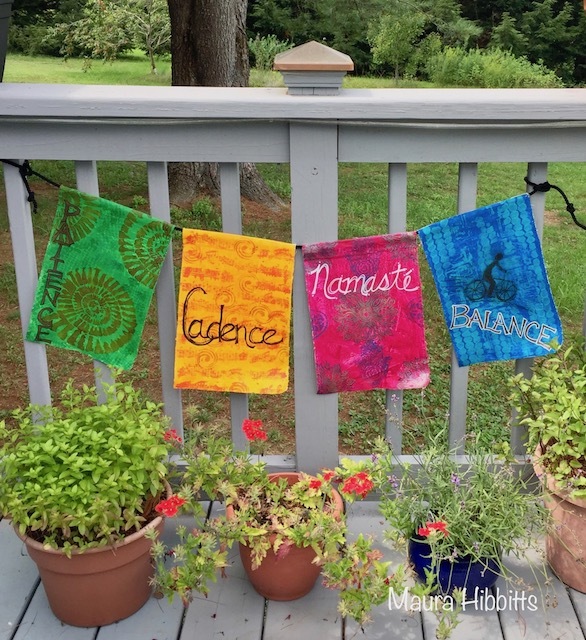 I’ve hung my prayer flags up on my deck railing for now. It will be interesting to see how they weather, but I’m not worried if they do. After all, the idea behind prayer flags is to have the winds carry that thought out into the universe for everyone to share.